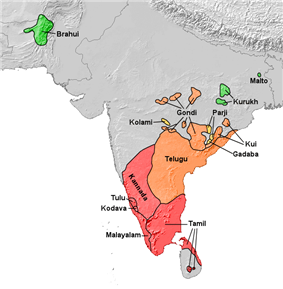 The Dravidian languages are a language family spoken mainly in southern India and parts of eastern and central India as well as in northeastern Sri Lanka, Pakistan, Nepal, Bangladesh, and overseas in other countries such as Malaysia and Singapore. 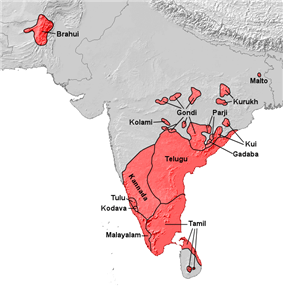 The Dravidian languages with the most speakers are Telugu, Tamil, Malayalam, and Kannada. There are also small groups of Dravidian-speaking scheduled tribes, who live beyond the mainstream communities, such as the Kurukh and Gond tribes. It is often speculated that Dravidian languages are native to India. Epigraphically the Dravidian languages have been attested since the 2nd century BCE. 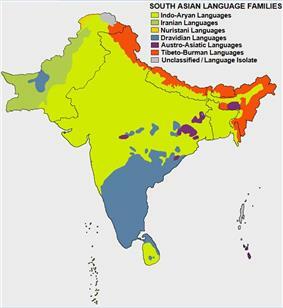 Only two Dravidian languages are exclusively spoken outside India, Brahui in Pakistan and Dhangar, a dialect of Kurukh, in Nepal. Dravidian place-names along the northwest coast, in Maharashtra, Goa, Gujarat, and to a lesser extent in Sindh, as well as Dravidian grammatical influence such as clusivity in the Marathi, Konkani, Gujarati, Marwari, and to a lesser extent Sindhi languages, suggest that Dravidian languages were once spoken more widely across the Indian subcontinent. The 1961 publication of the Dravidian etymological dictionary by T. Burrow and M. B. Emeneau was a landmark event in Dravidian linguistics. As for the origin of the Sanskrit word drāviḍa itself there have been various theories proposed. Basically the theories are about the direction of derivation between tamiẓ and drāviḍa. There is no definite philological and linguistic basis for asserting unilaterally that the name Dravida also forms the origin of the word Tamil (Dravida → Dramila → Tamizha or Tamil). Kamil Zvelebil cites the forms such as dramila (in Daṇḍin's Sanskrit work Avanisundarīkathā) damiḷa (found in Ceylonese chronicle Mahavamsa) and then goes on to say, "The forms damiḷa/damila almost certainly provide a connection of dr(a/ā)viḍa " and "... tamiḷ < tamiẓ ...whereby the further development might have been *tamiẓ > *damiḷ > damiḷa- / damila- and further, with the intrusive, 'hypercorrect' (or perhaps analogical) -r-, into dr(a/ā)viḍa. The -m-/-v- alternation is a common enough phenomenon in Dravidian phonology" Zvelebil in his earlier treatise states, "It is obvious that the Sanskrit dr(a/ā)viḍa, Pali damila, damiḷo and Prakrit d(a/ā)viḍa are all etymologically connected with tamiẓ" and further remarks "The r in tamiẓ → dr(a/ā)viḍa is a hypercorrect insertion, cf. an analogical case of DED 1033 Ta. kamuku, Tu. kangu "areca nut": Skt. kramu(ka)." Based on what Krishnamurti states referring to a scholarly paper published in the International Journal of Dravidian Linguistics, the Sanskrit word draviḍa itself is later than damiḷa since the dates for the forms with -r- are centuries later than the dates for the forms without -r- (damiḷa, dameḍa-, damela- etc.). The Monier-Williams Sanskrit Dictionary lists for the Sanskrit word draviḍa a meaning of "collective Name for 5 peoples, viz. the Āndhras, Karṇāṭakas, Gurjaras, Tailaṅgas, and Mahārāṣṭras". The Dravidian languages form a close-knit family – much more closely related than, say, the Indo-European languages. There is reasonable agreement on how they are related to each other. Most scholars agree on four groups: North, Central (Kolami–Parji), South-Central (Telugu–Kui) and South Dravidian. Earlier classifications grouped Central and South-Central Dravidian in a single branch. Some authors deny that North Dravidian forms a valid subgroup, splitting it into Northeast (Kurukh–Malto) and Northwest (Brahui). The classification below follows Krishnamurti in grouping South-Central and South Dravidian. Languages recognized as official languages of India appear here in boldface. In addition, Ethnologue lists several unclassified Dravidian languages: Allar, Bazigar, Bharia, Malankuravan (possibly a dialect of Malayalam), Vishavan, as well as the otherwise unclassified Southern Dravidian languages Mala Malasar, Malasar, Thachanadan, Ullatan, Kalanadi, Kumbaran, Kunduvadi, Kurichiya, Attapady Kurumba, Muduga, Pathiya and Wayanad Chetti to Tamil-Kannada. About 24% of India's population spoke Dravidian languages in 1981. This proportion is slowly falling due to higher birth rates in the Indo-Aryan-speaking Ganges Plain and in 2001 census it was around 21.5% or 220 millions of total population of 1,028,610,328 and it would be much less at present as per the trend. The origins of the Dravidian languages, as well as their subsequent development and the period of their differentiation are unclear, partially due to the lack of comparative linguistic research into the Dravidian languages. Although in modern times speakers of the various Dravidian languages have mainly occupied the southern portion of India, nothing definite is known about the ancient domain of the Dravidian parent speech. It is, however, a well-established and well-supported hypothesis that Dravidian speakers must have been widespread throughout much of India before the arrival of Indo-European speakers. The Brahui, Kurukh and Malto have myths about external origins. The Kurukh have traditionally claimed to be from the Deccan Peninsula, more specifically Karnataka. The same tradition has existed of the Brahui. They call themselves immigrants. Many scholars hold this same view of the Brahui such as L. H. Horace Perera and M. Ratnasabapathy. Proto-Dravidian is thought to have differentiated into Proto-North Dravidian, Proto-Central Dravidian, Proto South-Central Dravidian and Proto-South Dravidian around 500 BCE, although some linguists have argued that the degree of differentiation between the sub-families points to an earlier split. Despite many proposals, scholars have not shown a systematic relationship between the Dravidian languages and any other language family. Nonetheless, while there are no readily detectable genealogical connections, Dravidian shares strong areal features with the Indo-Aryan languages, which have been attributed to a substratum influence from Dravidian. The earliest known Dravidian inscriptions are 76 Old Tamil inscriptions on cave walls in Madurai and Tirunelveli districts in Tamil Nadu, dating from the 2nd century BCE. The Dravidian family has defied all of the attempts to show a connection with other languages, including Indo-European, Hurrian, Basque, Sumerian, and Korean. Comparisons have been made not just with the other language families of the Indian subcontinent (Indo-European, Austroasiatic, Tibeto-Burman, and Nihali), but with all typologically similar language families of the Old World. Dravidian languages display typological similarities with the Uralic language group, suggesting to some a prolonged period of contact in the past. This idea is popular amongst Dravidian linguists and has been supported by a number of scholars, including Robert Caldwell, Thomas Burrow, Kamil Zvelebil, and Mikhail Andronov. This hyphothesis has, however, been rejected by some specialists in Uralic languages, and has in recent times also been criticised by other Dravidian linguists such as Bhadriraju Krishnamurti. Dravidian is one of the primary language families in the Nostratic proposal, which would link most languages in North Africa, Europe and Western Asia into a family with its origins in the Fertile Crescent sometime between the last Ice Age and the emergence of proto-Indo-European 4–6 thousand years BCE. However, the general consensus is that such deep connections are not, or not yet, demonstrable. On a less ambitious scale, McAlpin (1975) proposed linking Dravidian languages with the ancient Elamite language of what is now southwestern Iran. However, despite decades of research, this Elamo-Dravidian language family has not been demonstrated to the satisfaction of other historical linguists. Vedic Sanskrit has retroflex consonants (ṭ/ḍ, ṇ) with about 88 words in the Rigveda having unconditioned retroflexes. Some sample words are Iṭanta, Kaṇva,śakaṭī, kevaṭa, puṇya and maṇḍūka. Since other Indo-European languages, including other Indo-Iranian languages, lack retroflex consonants, their presence in Indo-Aryan is often cited as evidence of substrate influence from close contact of the Vedic speakers with speakers of a foreign language family rich in retroflex consonants. The Dravidian family is a serious candidate since it is rich in retroflex phonemes reconstructible back to the Proto-Dravidian stage. In addition, a number of grammatical features of Vedic Sanskrit not found in its sister Avestan language appear to have been borrowed from Dravidian languages. These include the gerund, which has the same function as in Dravidian, and the quotative marker iti. Some linguists explain this asymmetrical borrowing by arguing that Middle Indo-Aryan languages were built on a Dravidian substratum. These scholars argue that the most plausible explanation for the presence of Dravidian structural features in Indic is language shift, that is, native Dravidian speakers learning and adopting Indic languages. Although each of the innovative traits in Indic could be accounted for by internal explanations, early Dravidian influence is the only explanation that can account for all of the innovations at once; moreover, it accounts for the several of the innovative traits in Indic better than any internal explanation that has been proposed. The Brahui population of Balochistan has been taken by some as the linguistic equivalent of a relict population, perhaps indicating that Dravidian languages were formerly much more widespread and were supplanted by the incoming Indo-Aryan languages. However it has been argued that the absence of any Old Iranian (Avestan) loanwords in Brahui suggests that the Brahui migrated to Balochistan from central India less than 1000 years ago. The main Iranian contributor to Brahui vocabulary, Balochi, is a western Iranian language like Kurdish, and arrived in the area from the west only around 1000 CE. Sound changes shared with Kurukh and Malto also suggest that Brahui was originally spoken near them in central India. Dravidian languages have a clusivity distinction. Dravidian languages are noted for the lack of distinction between aspirated and unaspirated stops. While some Dravidian languages have accepted large numbers of loan words from Sanskrit and other Indo-Iranian languages in addition to their already vast vocabulary, in which the orthography shows distinctions in voice and aspiration, the words are pronounced in Dravidian according to different rules of phonology and phonotactics: aspiration of plosives is generally absent, regardless of the spelling of the word. This is not a universal phenomenon and is generally avoided in formal or careful speech, especially when reciting. For instance, Tamil does not distinguish between voiced and voiceless stops. In fact, the Tamil alphabet lacks symbols for voiced and aspirated stops. Dravidian languages are also characterized by a three-way distinction between dental, alveolar, and retroflex places of articulation as well as large numbers of liquids. A substantial number of words also begin and end with vowels, which helps the languages' agglutinative property. This is the same as the word for another form of the number one in Tamil and Malayalam. This is used as an indefinite article meaning "a" and also when the number is an adjective followed by a noun (as in "one person") as opposed to when it is a noun (as in "How many are there?" "One"). This is still found in compound words, and has taken on a meaning of "double" in Tamil, Telugu, Kannada and Malayalam. For example, irupatu (20, literally meaning "double-ten"), iravai (20 in Telugu), or "iraṭṭi" ("double") or Iruvar (meaning two people) (in Tamil). The word tondu was also used to refer to the number nine in ancient sankam texts but was later completely replaced by the word onpadu. The Proto-Dravidian word "tol" is still used in Tamil to denote numbers such as 90, "thonnooru". ^ Nordhoff, Sebastian; Hammarström, Harald; Forkel, Robert; Haspelmath, Martin, eds. (2013). "Dravidian". Glottolog 2.2. Leipzig: Max Planck Institute for Evolutionary Anthropology. ^ West, Barbara A. (1 January 2009). Encyclopedia of the Peoples of Asia and Oceania. Infobase Publishing. p. 713. ^ Krishnamurti (2003), p. 21. ^ Ishtiaq, M. (1999). Language Shifts Among the Scheduled Tribes in India: A Geographical Study. Delhi: Motilal Banarsidass Publishers. pp. 26–27. ^ Krishnamurti (2003), p. 22. ^ Webb, Edward (1860), "Evidences of the Scythian Affinities of the Dravidian Languages, Condensed and Arranged from Rev. R. Caldwell's Comparative Dravidian Grammar", Journal of the American Oriental Society Vol. 7. 271–298. ^ Burrow, T. (1944) "Dravidian Studies IV: The Body in Dravidian and Uralian". Bulletin of the School of Oriental and African Studies 11:2. 328–356. ^ a b Zvelebil, Kamal (2006). Dravidian Languages. In Encyclopædia Britannica (DVD edition). ^ a b Trask (2000), p. 97. ^ Elfenbein, Josef (1987). "A periplus of the 'Brahui problem'". Studia Iranica 16 (2): 215–233. Dravidian languages page from the MultiTree Project at the LINGUIST List.